I know, I know.. I have been slacking on the writing of my blog. Buttt I have some awesome news to share! Last week I was at my internship, minding my business when I decided to take a little brake from work. I visited this website where they have amazing deals on vacations and plane tickets. I saw a deal that I could not resist! 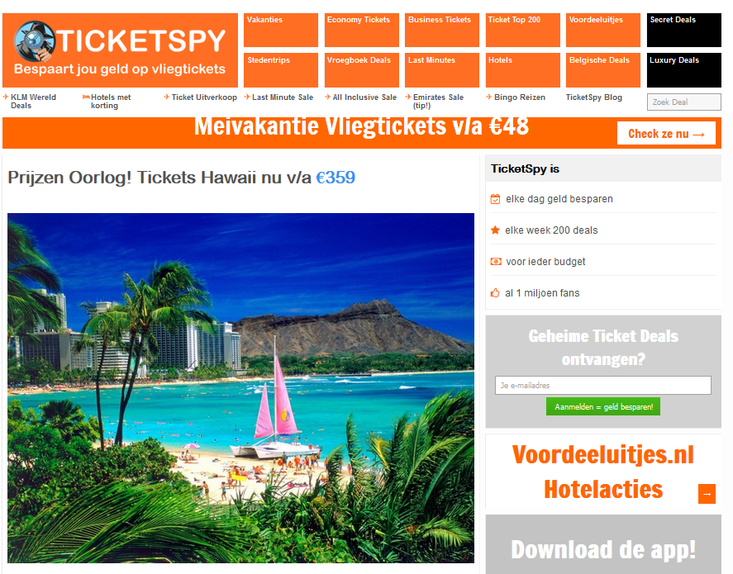 A round trip ticket to... HAWAII for only € 359,-!!! Excited that I was, I checked the dates of the trip. It turned out to be in the beginning of my graduation period of my Law studies.. But then again, we should seize the day! I called my boyfriend and we decided to book the tickets straight away for February next year. This way we could save up some money for the trip. So yeah.. it's final. We are going to Honolulu with a stopover at Vancouver. Major travel-junky that I am, even the stopover at Vancouver gets me excited! After all I have never seen Canada before. Currently I am in the final weeks of my internship. It is going to be weird to be going to school again. But this time I am not going back to my current school. I decided to apply for a minor at different school, in a different city. I am going to follow the minor Entrepreneurship in Rotterdam. At least, I hope I will since I still have to pitch a business idea and take a test before being fully admitted to the studies. For now let the planning begin. Honolulu here we come!